Our year-round production in the Canaries are increasing our cast team due to extended growth and increased shows. Summer Contracts commence in May/ June 2019 and run for 6/9 months initially, however as a non-seasonal production we do offer extensions and longer periods for those who perform well. 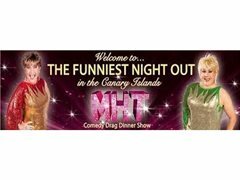 MHT Music Hall Tavern Productions run 3 Canaries shows, with permeant bases in Tenerife and Lanzarote. The production has been running for 25 years and is growing each year. The production is a non-blue, non-offensive family friendly show with Live Singing, Dance, Comedy Live and Mime. MHT is a Comedy Drag Dinner show, however we firmly base our Cast members as a Glamorous Show Girl Drag Queen. The Canaries show is a Theatre based production values which runs in a close-up cabaret venue of 120-200 People per night. MHT is an award-winning leading show, supplied by all the major tour operators and as featured on BBC, ITV, Ok Magazine and Channel 4, As well as running a highly acclaimed UK and Ireland Theatre tour. Want to Try Something New? Try MHT Show Cat Member! Apply Today!